The Paintgirl Studio features the work of decorative painter, Kathy Bubaris. Kathy is a classically trained artist with a degree in fine arts and over 20 years experience in the decorative arts field. Through seminars, workshops and frequent trips to Europe, she keeps herself informed of the latest trends and techniques and passes that knowledge onto her clients. 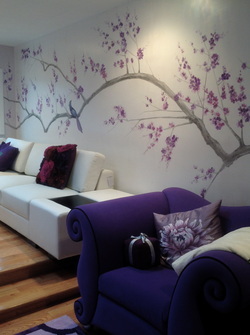 The Paintgirl Studio offers a full range of decorative painting services including murals and specialty wall finishes. Other services include, furniture and cabinet refinishing, decorative moldings, stenciling, color consultations, repairs and touch-ups and base painting. From a simple project to an entire room makeover, The Paintgirl Studio can assist you with design ideas to create the look you would like to achieve.